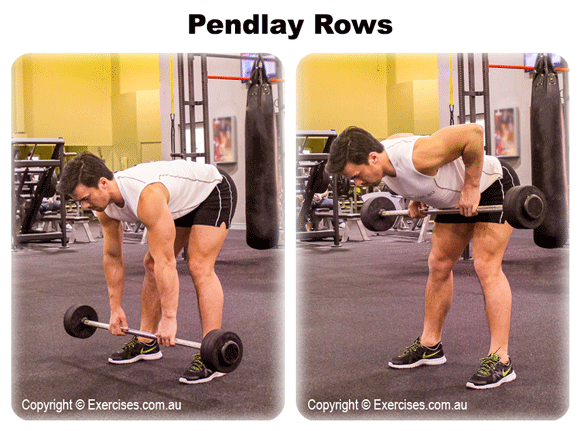 Pendlay Rows is a great exercise for developing the entire back, traps, rear shoulders, biceps and forearms. It will also activate the hamstrings, glutes, hips and core muscles as stabilisers during the exercise. Pendlay Rows also builds power and speed. This is a great addition to your workout if you are into Cross Fit, rugby and any rowing sport. Take a shoulder width stance with feet in a neutral position. Grab the barbell with an overhand grip that is wider than shoulder width. Tighten your core and keep a flat back position. Your knees must be slightly bent and adjust your body so that the torso is parallel to the floor. Pull the barbell off the floor in a straight line with your elbows moving toward your lats. Allow the bar to touch your body in an area close to the sternum. Lower the bar back to the ground in a controlled manner. Let it rest on the ground for a count of “one” before you start the second rep.
Because your torso will be parallel to the floor, make sure your back doesn’t hunch over during the pull as it will place compression forces on your lower back and put your shoulders at risk of injury. Perform Pendlay Rows in a strict and controlled manner. Do not jerk up the bar and use momentum to bring it to your sternum. 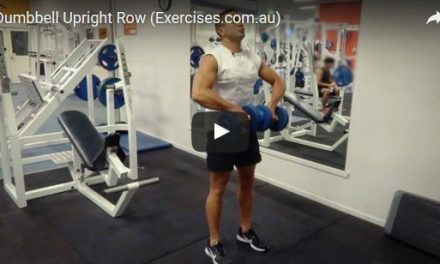 Pendlay Rows done properly will build power in your hips and back.